You take your business seriously don’t you? Of course you do, or you wouldn’t be running it – you’d be taking the easier option and working for someone else. So does that mean you have to work all day, every day and never take any time off? I was caught in a conversation with someone recently who took exactly that view, but I’m not so sure. You have to be seen to be working hard to be taken seriously. 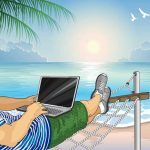 The basic argument put forward in favour of never truly … [Read more...] about Is it OK to take time off when you run a business?